Donations from CDGA Foundation supporters help us provide free golf programming to individuals with special needs, veterans and youth. 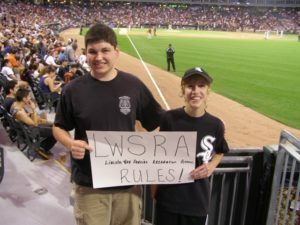 Since 2008, the CDGA Foundation has partnered with the Chicago White Sox, allowing Foundation participants and friends to purchase tickets to a game in support of the CDGA Foundation. This year’s game is slated for Thursday, Aug. 30 when the White Sox square off against the Boston Red Sox at Guaranteed Rate Field. You can order tickets for yourself or buy some for CDGA Foundation athletes. Ticket ordering information will become available this spring. Midwest Golf House is home to several golf organizations and also serves as regional offices for national golf associations. Show your unending support of the game in this region by purchasing a commemorative brick, to be placed in front of Midwest Golf House! Bricks are available in two sizes; 4x8 bricks contain three lines of text (13 characters/line) and 8x8 bricks contain six lines of text. Smaller bricks are available for $150 each, with the larger pavers available for a $500 contribution. The CDGA Foundation reserves the right to approve all messages prior to production. Prior to production, you will receive confirmation of the text on your brick. For more information on commemorative bricks, please contact Alex Nolly at anolly@cdga.org or (630) 685-2351. The Foundation’s annual giving program for clubs, the Sunshine Club, is a key component in funding our programs. The Sunshine Club is comprised of clubs which ask their members for a $35 per member annual donation, which is fully tax-deductible. Don’t see your club? Contact Denny Davenport at ddavenport@cdga.org or (630) 272-7872 for how your club can get involved!